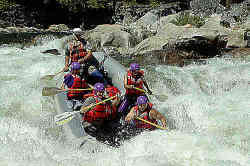 www.Stanislaus-River.com was designed to provide accurate and useful information to experienced whitewater rafters. This site features whitewater rafting access & shuttle directions and river descriptions, including a mile-by-mile guide. www.Stanislaus-Rivers.com also provides information about camping, and permit requirements for the North Fork of the Stanislaus river. The in-house web development team at All-Outdoors California Whitewater Rafting has created this website to serve as an educational and informational resource for guests, guides and the general whitewater rafting community. Unless otherwise specified, all content provided on this site is for your personal and non-commercial use. You may not modify, copy, distribute, transmit, display, perform, reproduce, publish, license, create derivative works from, transfer, or sell any information, products or services obtained from the Stanislaus-River.com website, or any affiliated content provider, without express permission from the original authors.